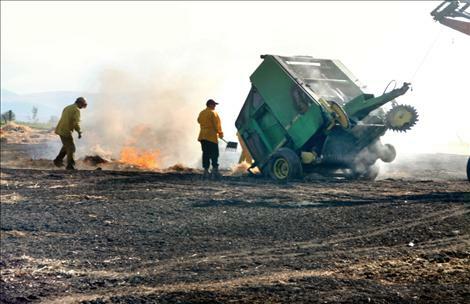 Firefighters work to put out a fire caused by a spark from a baler near St. Ignatius. Approximately 20 acres were scorched. ST. IGNATIUS – Combined efforts from the St. Ignatius Fire Department and Confederated Salish and Kootenai Tribes’ Division of Fire conquered a 20-acre fire started by a straw baler last Monday afternoon. “It’s dry enough that it only takes a spark,” St. Ignatius Fire Chief Martin Frazzini said. But Frazzini would take it a step further. It didn’t take much to start the field fire on Foothill Road. “I looked back and saw the fire in the windrow behind me,” said farmer Roger Detert. Neighbors saw the flames and called the fire department as Detert quickly drove the bailer hooked onto his tractor into the adjacent green field. “I was headed for the sprinklers,” he said. Detert speculated that the bearings inside the baler became hot while he baled straw and created a small spark. The dry straw quickly caught fire in the powder dry dirt. Everyone involved was thankful the blaze was stopped. “I’d like to extend thanks to the Tribal fire department. We would have been out here a lot longer without them,” Frazzini said. Detert was grateful the only casualties included the baler, ten straw bales and a box of tools.